Frequency: The train runs every 5 – 15 minutes. Next train: Text 10120 to 27299 to get a text telling when next train is due. 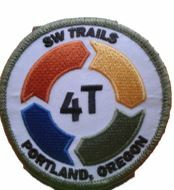 Trail head: Directions to Washington Park train stop. Tickets: If you don’t already have a valid TriMet ticket, you’ll need to purchase one from a ticket kiosk. Adult tickets are good for 2 1/2 hours and cost $2.50 ($1.25 for youths and $1.25 for seniors) . All day tickets cost twice as much. TriMet tickets, while valid, are good for use on both the Train, Trolley, and Bus. Restrooms: At Central Library at end of trip and Zoo at beginning of trip. Pets: Unless it’s a service animal, your pet must be kept in a carrier. TriMet’s MAX Light Rail train system connects Portland with Gresham, Beaverton, Hillsboro and the Portland International Airport. The 4T train ride from the Zoo to Downtown includes part of the 3-mile-long Robertson Tunnel. 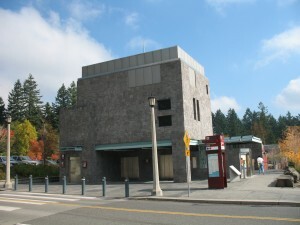 The Washington Park MAX station the only completely under-ground station in the MAX system, at 260 feet/70 meters below the surface. It is also the deepest station in North America, and second deepest in the world (after Moscow’s Park Pobedy at 318 feet/97 m). Train Station (MAX) at the zoo. then take elevator down to train. See the interpretive signs located at the east end of Aucoin Plaza, where the elevators to MAX are located. Use the bathrooms here if needed. You can eat at the Oregon Zoo restaurant or use Zoo bathrooms without paying the entry fee for the zoo. Purchase your ticket and validate it at a kiosk prior to descending in the elevator to the MAX train. Take the train going toward “City Center”, “Gresham” or “Airport”. Get off at the Library/SW 9th Ave stop. This is the 4th station from the zoo. The Central Library is right here as are a number of shops and restaurants. 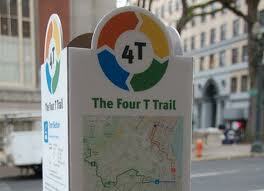 Follow the 4T signs around the Library to the Portland Street Car (trolley) stop at 11th and Taylor. The trolley part of the 4T will take you to the South Waterfront neighborhood and the Portland Aerial Tram.